Djokovic has gone on to reach the final seven times from those 11 straight last-four appearances, and victory over Nishikori would move him alongside Pete Sampras and Ivan Lendl’s record appearances total in the men’s showpiece. A bigger piece of history awaits, however, if he can go all the way in New York – a 14th Grand Slam victory would rank him alongside Sampras, and behind only Federer (20) and Nadal (17), in major triumphs. But first he had to get past the energetic Millman on another stuffy night on Arthur Ashe Stadium. Djokovic had breezed past the Australian on grass at Queen’s Club in June – their only previous meeting – dropping just three games. This time he was made to work much harder. The former world number one missed 16 of 20 break points, and was pegged back from 3-1 up in the third set, before winning 12 of the final 15 points to advance. A failure to convert break points was not the only problem faced by Djokovic. Not for the first time at the tournament he struggled in the conditions which, although still hot and humid, appeared much easier than on previous nights. He was given some tablets during the second set – but declined to say what they were when asked in his post-match media conference. “I personally have never sweat as much as I have here. Incredible. I have to take at least 10 shirts for every match. It’s literally after two games and you’re soaking,” Djokovic said. “I asked the chair umpire whether they are using some form of ventilation or air conditioning down at the court level, and he says that ‘he’s not aware of it’, that, you know, only what comes through the hallway type of thing. 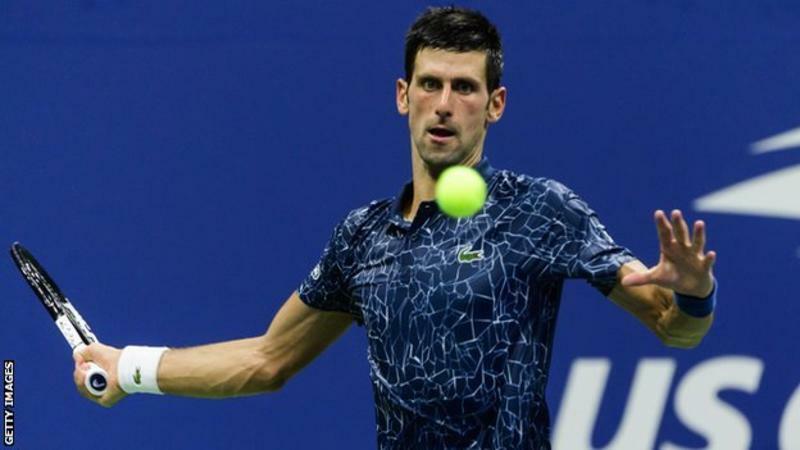 Djokovic was also given time violations in successive points when serving at 3-2 in the third set, meaning he lost his first serve while break point down, and Millman duly capitalised. The Australian also suffered with the heat, having to disappear off court at 2-2 in the second set to change his sweat-soaked kit. “[In] these night matches, the humidity goes through the roof,” he said. Ball boys and girls had to wipe the court with towels between games, and the USTA issued a statement afterwards confirming the chair umpire allowed Millman to leave the court after determining the surface was “dangerous”. Millman produced a big shock when he inflicted a four-set defeat on Swiss second seed Federer in the last 16, ending the possibility of a meeting between two of the game’s greats in the quarter-finals. The affection of the New York crowd followed Millman into his match against Djokovic – and he thrived on the backing. The 29-year-old, often chatting and interacting with his supporters in the stands, fed off the crowd’s energy as he continued to frustrate Djokovic. He entertained them with some remarkable retrieving, in addition to clutch serving and the odd brilliant winner, on his way to seeing off 11 break points – between the ones Djokovic did convert for a 2-0 lead in the first set and a 5-4 advantage in the second. But he was unable to test the Serb’s serve often and when he did, breaking back to level the third set at 3-3, Djokovic hit straight back. Naomi Osaka says winning the US Open last month was a "bittersweet" moment and "not the happiest memory" following Serena Williams' on-court outbursts.